Alibaba.com, founded in Hangzhou, China in 1999 as a B2B marketplace to connect Chinese manufacturers with overseas buyers, has become one of the leading platforms for global wholesale trade. Alibaba.com is part of Alibaba Group, the Internet giant that is responsible for nearly 80 percent of China’s online shopping through a growing number of websites. While other Alibaba Group websites such as Taobao and Tmall focus on the consumer, Alibaba.com is set up as a B2B portal that makes it possible to find just about anything from wholesalers around the world. Currently, there are hundreds of millions of products in over 40 categories and from nearly 200 countries and regions. 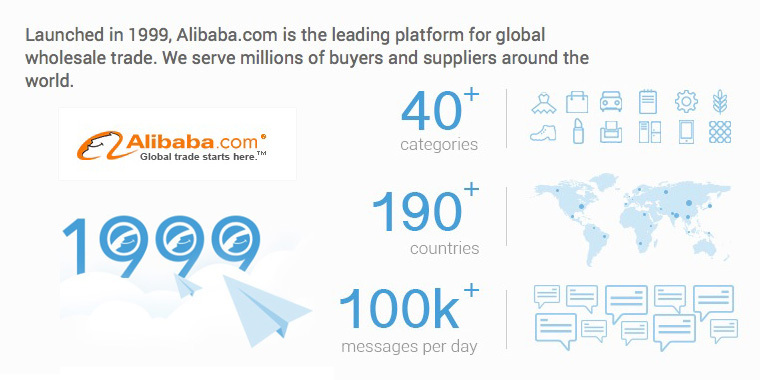 On an average day, Alibaba.com handles over 100,000 messages from global buyers and sellers. Every day, Alibaba.com handles over 10,000 cross-border orders worth an estimated $30 million. What differentiates Alibaba.com from other B2B wholesale competitors is its interface, which replicates the ease-of-use of a classic B2C e-commerce site such as Amazon.com. The categories on the Alibaba.com site include apparel, electronics, machinery, gifts, sports, food, health & beauty, and even auto & transportation. A search function placed prominently on the page enables buyers to quickly find what they are looking for. Since this is a B2B e-commerce site, there can be minimum order sizes for each product. As a middleman, Alibaba.com provides services for both buyers and sellers to facilitate trade. For buyers, Alibaba.com provides credit lines, inspection services and secure payment options. There is also a vibrant buyers community, including forums and answers for buyers who are new to Alibaba.com. For sellers, the services offered by Alibaba.com include supplier memberships, a learning center and a training center. There are also authentication and verification services that enable sellers to gain trust from buyers, as well as predictive analytics tools. The extension of Alibaba.com services, in many ways, is a response to the global reach of the platform. While this global reach is largely a positive, recently Alibaba.com has been forced to respond to complaints that some products sold on the site are counterfeits or fakes. This is an especially important issue as Alibaba.com moves deeper into key Western markets, such as the US market. In 2014, there were 7 million U.S. buyers, compared to only 2 million in 2011. In 2014, there were also nearly 1.5 million UK buyers. Since the e-commerce platform is part of Alibaba Group, it’s no surprise that the website’s growth trajectory over the past 15 years has tracked that of Alibaba Group. As new products and offerings become available within Alibaba Group, especially those related to predictive analytics and financing, they can become a way to boost the overall growth of Alibaba.com. The mission of Alibaba.com is “to make it easy to do business anywhere.” As a result, new wholesale opportunities in 2016 include a chance to extend Alibaba.com’s leading market position using mobile payments. The goal, says Alibaba Group founder Jack Ma, is to make it possible for buyers to source anything with just a mobile phone. Given the enormous scale and scope of Alibaba.com, combined with the global penetration rates for mobile, it appears that Alibaba.com will soon be able to deliver on this promise. Your comments welcome on the wholesale market in China! And please, share your experience on online trading with Alibaba services.